FORT WORTH, Texas – The Davey O’Brien Foundation has announced the Hunt Family as the recipient of the 2014 Charles Ringler Founder’s Award. Established in 2004, the award honors an individual, group or corporation that demonstrates Ringler’s passion, pride and perseverance toward the Foundation. Over the past half-century, the Hunt Family has shown an unwavering commitment to the growth of football both locally and nationally. The family began serving the Foundation at its inception in 1977, and was instrumental in the creation of the Foundation and the development of the Davey O’Brien Legends Award. 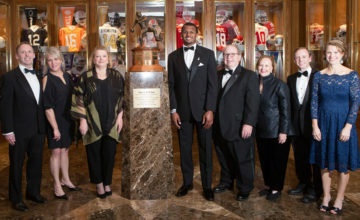 Among their many contributions include longtime Foundation trustee, the late Lamar Hunt, creating the Davey O’Brien Hall of Fame in 1985 to showcase the winners of the Davey O’Brien Memorial Trophy and Davey O’Brien National Quarterback Award. Due to their support, nearly 40 years of college football history is showcased on permanent display. The Hunts possess a deep, storied legacy in the game of football. Lamar founded the American Football League (AFL) in 1960 and served as owner of the Dallas Texans franchise, which later became the Kansas City Chiefs. 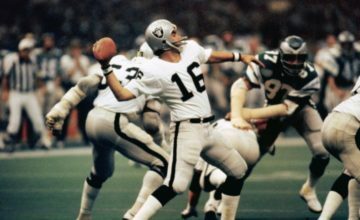 He is also credited with naming the NFL’s championship game the Super Bowl. His Chiefs played in the inaugural Super Bowl, and three years later, claimed Kansas City’s first major sports championship by defeating the Minnesota Vikings in Super Bowl IV. In 1972, Lamar became the first AFL figure to be inducted into the Pro Football Hall of Fame, and each year the Lamar Hunt Trophy is presented to the winner of the NFL’s American Football Conference (AFC). In total, Hunt is a member of 13 different halls of fame, including the National Soccer Hall of Fame, the International Tennis Hall of Fame and the business and sports halls of fame in both Texas and Missouri. The Hunt Family is one of six current NFL franchises owned by the same individual family for more than 50 years. Clark Hunt has been involved in the leadership of the Kansas City Chiefs for more than a decade and currently serves as the club’s Chairman and CEO. He also serves as Chairman of the NFL’s International Committee and leads the league’s International Series. In this role, he steers the efforts to broaden the NFL’s footprint overseas and grow the game worldwide. Clark is also the Chairman and CEO of FC Dallas of Major League Soccer. Ringler, a longtime friend of O’Brien, established the Foundation and O’Brien Memorial Trophy in 1977. 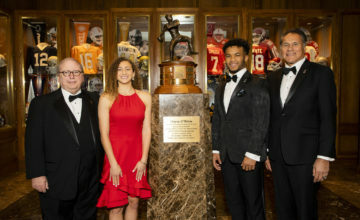 Ringler’s leadership and steadfast commitment helped the regional O’Brien Memorial Trophy Award become the Davey O’Brien National Quarterback Award. Over the past three-plus decades, the award has continued to gain national recognition and prestige. Previous recipients of the Charles Ringler Founder’s Award include: Dr. Bobby Brown (2013), Pat Evans and Bobby McGee (2012), Keith Jackson (2009), Robert Lansford and JPMorgan Chase (2008), William E. Scott Foundation (2007), American Airlines (2006), The Fort Worth Club (2006), Lamar Hunt (2005), Don Looney (2005) and Dan Poland (2004). The Charles Ringer Founder’s Award will be presented at the 38th Annual Davey O’Brien Awards Dinner on Monday, Feb. 16, at The Fort Worth Club. Others to be honored that evening will be National Quarterback Award winner Marcus Mariota, Legends Award winner Warren Moon and High School Scholarship recipient Christine Vonder Haar.